Recent bond market moves have triggered some rather excited commentary. Central banks allegedly have pumped up a bubble that will cause the financial markets to explode in some amazing fashion. The reality is a lot more sedate – the bond market is bracing for a Fed rate hike sequence that may hit this autumn (assuming that it is not delayed – again). Given that governmental interest rates are at levels that are completely unattractive for liability matching (outside of Greece! ), no sensible asset allocator should care about a marginal repricing in bonds. The only reason you want to own bonds is an insurance against a selloff in equities (and other risk assets) – and a few rate hikes by the Fed is not enough to trigger an equity correction by itself. 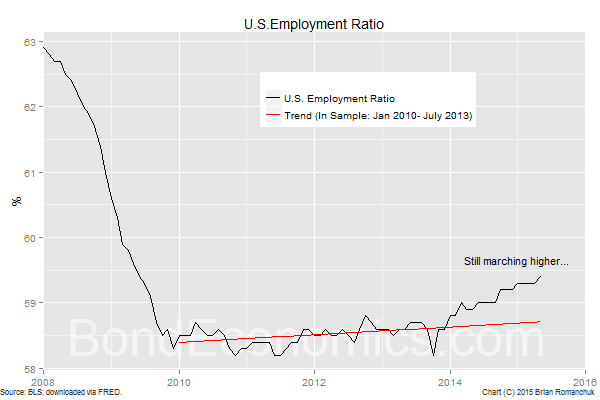 The chart above shows that the employment ratio in the United States has once again ticked up. Unless the fallout from the oil patch gathers steam, the job market still has enough momentum to look through temporary slowdowns. The United States is a long way from overheating, but it is getting harder and harder to justify keeping the policy rate near zero. Events in Greece do hang over the global markets; it would be very easy for a Greek exit to trigger very bad things for global risk markets. My view that the eurocrats’ primary objective is that they do not want anything to interrupt their summer vacations. As a result, I think there is a good chance of the can being kicked yet again down the road, for at least a few months. Nevertheless, it appears that the long-term prospects are much gloomier. Normal volatility is the standard deviation of daily (absolute) changes of the yield; it is expressed above in terms of basis points per day (100 basis points = 1%). This is also sometimes expressed as an annualised figure (you multiply the daily volatility by the square root of the number of trading days in a year). This is a different convention from the way that is usually expressed in other markets (such as equities), where volatility is given in terms of the standard deviation of percentage changes of prices. Expressing the volatility in this fashion would make comparisons between different points of the yield curve meaningless (as it would just validate the fact that long-duration bonds have more price volatility than short-duration debt). When we look at the data, we see that recent volatility is in no sense unusual. It is possible that intraday volatility is higher (courtesy of High Frequency Trading), but there is a simple solution to this volatility – turn off the price screens and go back to doing useful work. Daily volatility matters if you are trading options. However, if prices are going up and down rapidly within a tight trading range, there is no reason for an asset allocator to care. What matters for asset allocation is how fast yields are moving in one direction. The chart above shows the 3-month change in the 10-year yield (on an end-of-month basis). It has been common for the 10-year yield to move 100 basis points over a quarter. Such an event is possible this year (assuming the Fed indeed hikes rates), but it is hard to see an overshoot much further than that. As a result, there is no reason to think that anything of particular interest will happen (for those of us without levered bond positions). It should be noted that the German 10-year bund yield (not shown) has been more volatile than the U.S. 10-year Treasury Note. Apparently, it is not a good idea to buy 10-year paper at sub-0.50% yields. 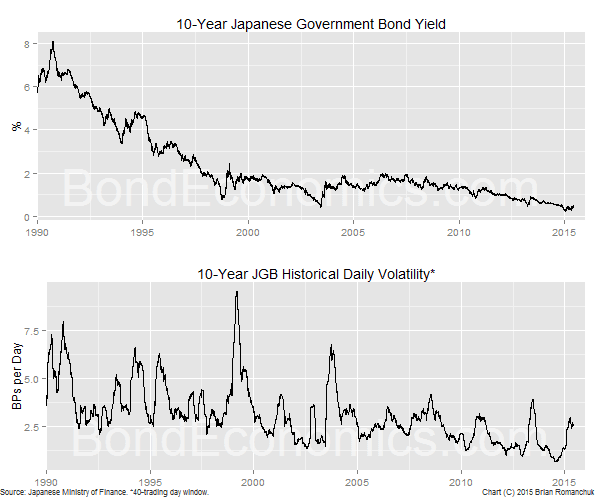 I had thought the Japanese experience in 2003 was enough to teach that lesson, but it seems that the current generation of traders had some new theories about bond valuation. A rapid cleanout of nonsensical positions is a standard market event, but such moves do not last too long. A serious bond bear market needs to be ratified by central bank rate hikes. 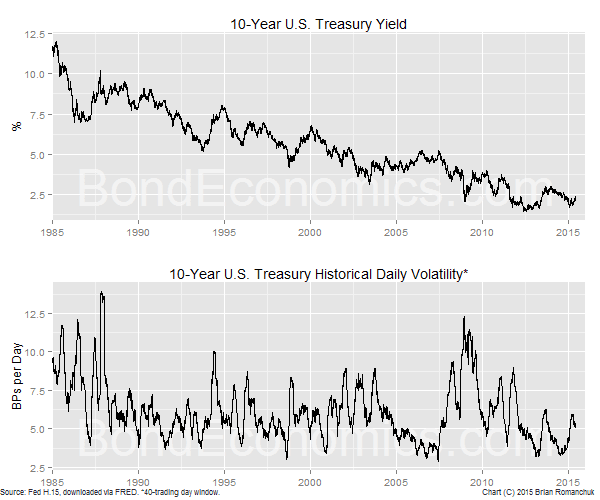 There is an alternative means of looking at the volatility of bond yields – log-normal volatility. This is calculated by taking the standard deviation of the percentage change in yields. (You can get the same effect by taking the standard deviation of the changes in the logarithm, hence the name.) For example, if the 10-year yield is 5%, and the log-normal (annual) volatility is 20%, that implies that the annualised standard deviation of the yield is 100 basis points (20% of 5%). You can price fixed income options using either form of volatility (after making the appropriate conversion). 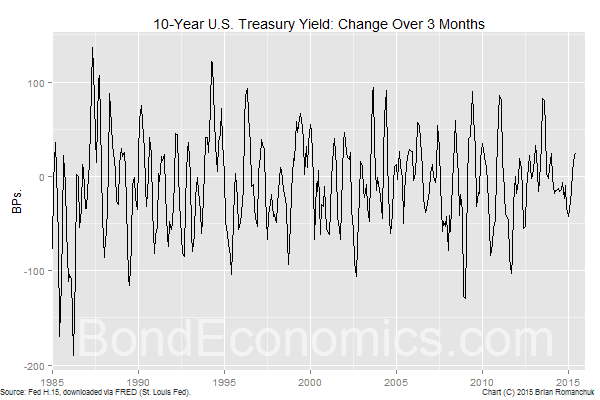 However, the two models generate different predictions about bond yields. In a log-normal world, the daily changes in bond yields should become lower and lower as the yield drops towards zero. That is, if the log-normal volatility is unchanged, and the bond yield drops from 4% to 2%, the daily changes will be half the size. Using such a framework, negative rates are impossible. If you instead use a normal volatility, the size of the daily changes is independent of the level of rates. This makes it possible for the option-pricing model to predict negative interest rate outcome. Japanese yields offer a good deal of experience with a low rate environment. The 10-year JGB yield is less volatile than the U.S. 10-year yield, but it has kept stable despite the crazily low level of yields in 2015. The highest volatility was recorded in 1998, even though the yields were mainly below 2%. Therefore, we see that log-normal volatility is not the best description of yield volatility. A certain amount of bond market turmoil around a rate hike cycle is to be expected, but there is no reason for anyone not directly involved in the fixed income markets to care.